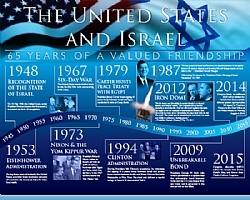 "America is safer when Israel is safer. Israel is safer when America is safer. Those bonds can never be broken." "As long as I am in office, Israel and the U.S.-Israel relationship will have a vocal and tireless advocate." "We all raise our voices that we are strong allies of Israel, but words without actions do not make a difference." "Iron Dome is saving lives and protecting the U.S.-Israel relationship." These were the sentiments expressed by some of the most influential leaders of the House of Representatives at the third annual U.S. - Israel Security Alliance Congressional Tribute. 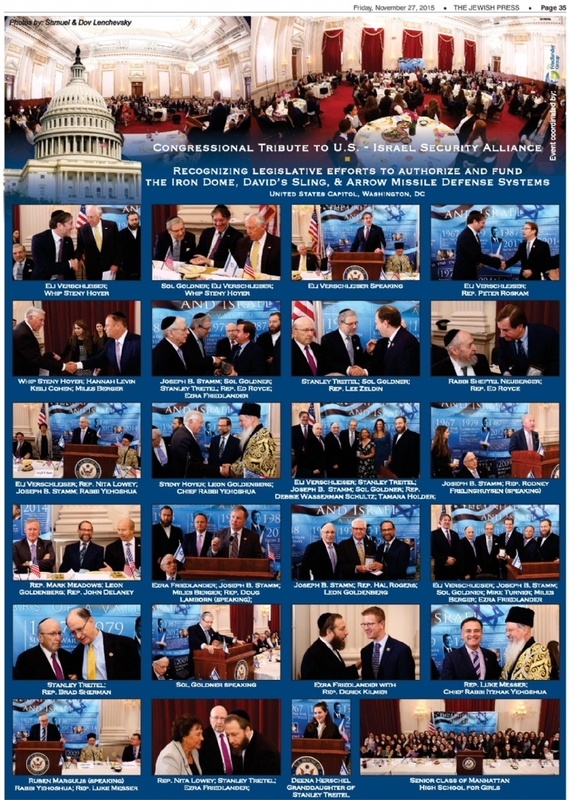 On November 5, 2015, hundreds gathered to pay tribute to the key Chairs and Ranking Members of the House Committees which directly impact the security alliance between the U.S. and Israel and are responsible for the funding of the Iron Dome, David's Sling and Arrow Missile Defense Programs. The U.S. - Israel Security Alliance Congressional Tribute honored: Rodney Frelinghuysen, Chairman of the House Appropriations Subcommittee on Defense; Steny Hoyer, House Democratic Whip; Derek Kilmer, member of the House Appropriations Committee; Doug Lamborn, Vice Chairman of the House Armed Services Subcommittee on Strategic Forces; Nita Lowey, Ranking Member of the House Appropriations Committee; Luke Messer, Republican Policy Committee Chairman; Peter Roskam, Co-Chair of the House Republican Israel Caucus; Ileana Ros-Lehtinen, Chair of the House Foreign Affairs Subcommittee on the Middle East and North Africa; Hal Rogers, Chairman of the House Appropriations Committee; Mike Rogers, Chairman of the House Armed Services Subcommittee on Strategic Forces; Ed Royce, Chairman of the House Foreign Affairs Committee; Debbie Wasserman Schultz, Chair of the Democratic National Committee; Mike Turner, Chairman of the House Armed Services Subcommittee on Tactical Air and Land Forces. "Members of Congress came together in a strong display of bipartisanship to pledge their continued and increased support of Israel's Missile Defense Programs and reiterate the necessity of these Defense Systems to protect civilian populations from enemy rocket fire and for that we are eternally grateful" said the event's co-chairs: Eli Verschleiser, Miles Berger, Joseph B. Stamm, Sol Goldner, Leon Goldenberg and Stanley Treitel in unison. The invocation and benediction were delivered respectively by Bukharian Chief Rabbi Itzhak Yehoshua and Rabbi Sheftal Neuberger of Ner Israel Rabbinical College. Ezra Friedlander, CEO of The Friedlander Group, pointed out that, "The U.S. - Israel Security Alliance Congressional Tribute emphasized the unwavering commitment of Congress to defend Israel and reaffirms America's commitment to Israel's security."